The researchers have created a novel nanosheet – a thin layer of semiconductor that measures roughly one-fifth of the thickness of human hair in size with a thickness that is roughly one-thousandth of the thickness of human hair – with three parallel segments, each supporting laser action in one of three elementary colors. The device is capable of lasing in any visible color, completely tunable from red, green to blue, or any color in between. When the total field is collected, a white color emerges. The researchers, engineers in ASU’s Ira A. Fulton Schools of Engineering, published their findings in the July 27 advance online publication of the journal Nature Nanotechnology. Cun-Zheng Ning, professor in the School of Electrical, Computer and Energy Engineering, authored the paper, “A monolithic white laser,” with his doctoral students Fan Fan, Sunay Turkdogan, Zhicheng Liu and David Shelhammer. Turkdogan and Liu completed their doctorates after this research. 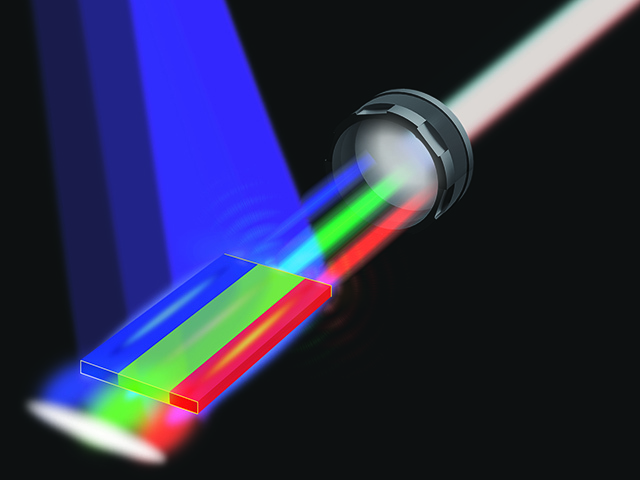 The technological advance puts lasers one step closer to being a mainstream light source and potential replacement or alternative to light emitting diodes (LEDs). Lasers are brighter, more energy efficient, and can potentially provide more accurate and vivid colors for displays like computer screens and televisions. Ning’s group has already shown that their structures could cover as much as 70 percent more colors than the current display industry standard. The main challenge, the researchers noted, lies in the way light emitting semiconductor materials are grown and how they work to emit light of different colors. Typically a given semiconductor emits light of a single color – blue, green or red – that is determined by a unique atomic structure and energy bandgap. The “lattice constant” represents the distance between the atoms. To produce all possible wavelengths in the visible spectral range you need several semiconductors of very different lattice constants and energy bandgaps. Recognizing this unique possibility early on, Ning’s group started pursuing the distinctive properties of nanomaterials, such as nanowires or nanosheets, more than 10 years ago. He and his students have been researching various nanomaterials to see how far they could push the limit of advantages of nanomaterials to explore the high crystal quality growth of very dissimilar materials. Six years ago, under U.S. Army Research Office funding, they demonstrated that one could indeed grow nanowire materials in a wide range of energy bandgaps so that color tunable lasing from red to green can be achieved on a single substrate of about one centimeter long. Later on they realized simultaneous laser operation in green and red from a single semiconductor nanosheet or nanowires. These achievements triggered Ning’s thought to push the envelope further to see if a single white laser is ever possible. “We have struggled for almost two years to grow blue emitting materials in nanosheet form, which is required to demonstrate eventual white lasers, ” said Turkdogan, who is now assistant professor at University of Yalova in Turkey. Five scholars from Kinnaird Women's College in Pakistan spent the spring semester at ASU, studying American literature and culture and working to dispel myths about their home country. Aurakzai knows a different view of her home country. Pakistan has an active civil society, with many strong women leaders who are key to combating extremism in the Islamic South Asian Republic. It is also a place of rich culture, history and diversity. Aurakzai worked to convey Pakistan’s complexity to students and faculty she met at Arizona State University and in the surrounding community. Aurakzai is a lecturer in the English department at Kinnaird College for Women in Lahore, Pakistan. She and four other scholars from Kinnaird – Zahra Hamdani, Kanza Javed, Mahwish Khan and Aisha Usman – spent the spring 2015 semester at ASU funded by a grant from the U.S. Embassy in Islamabad, Pakistan. The three-year project, “Globalizing Research and Teaching of American Literature: A University Partnership between ASU and Kinnaird College (Lahore),” aims to create an academic, research and knowledge exchange that will help to empower Pakistani women in academia and in society. Faculty and staff from ASU’s Department of English and the Center for the Study of Religion and Conflict co-direct the project and participated in the first wave of exchanges to Pakistan in fall 2014 while ASU hosted two scholars from Pakistan. The newest Pakistani cohort arrived in January 2015 and participated in classes, attended cultural events, met with mentors and gave presentations of their own research and scholarship during the semester-long ASU visit. One course that two Pakistani scholars attended was professor Melissa Pritchard’s English 594: Creative Writing – Fiction class. Not only did the women gain insight on trends in the field of contemporary American literature, their very presence in the classroom was a learning experience for their U.S. counterparts. “Having students from overseas in ASU classes brings new perspectives that many students haven’t considered,” said Carolyn Forbes, assistant director of the ASU Center for the Study of Religion and Conflict and project manager for the exchange. 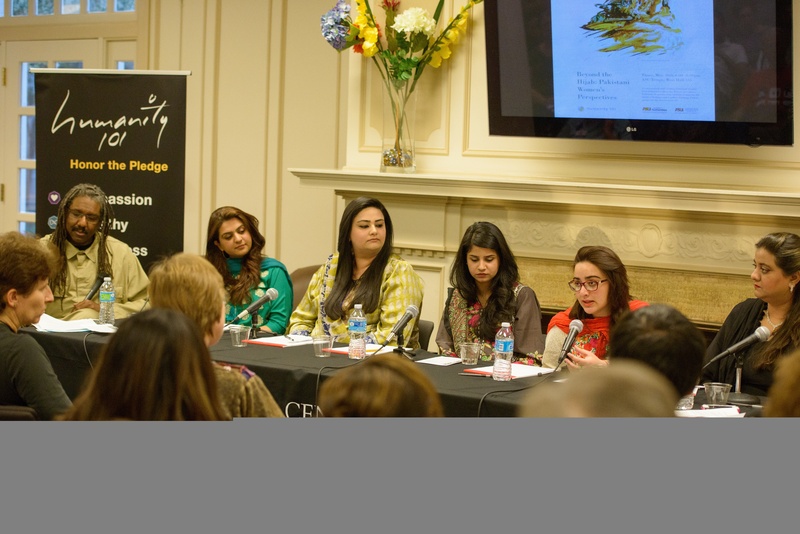 The ASU hosts, which in addition to Forbes included English faculty Deborah Clarke, Claudia Sadowski-Smith and Neal A. Lester, as well as Hardt-Nickachos Chair in Peace Studies Yasmin Saikia, provided opportunities for the Pakistani scholars to be immersed in multi-ethnic literatures of the U.S. In particular, the group focused on introducing the unique culture of the American Southwest. Forbes said that she and her colleagues did their best to minimize culture shock for the participants. One boon: Forbes found a house to rent, so the Pakistani women were all able to stay together. “The house was within walking distance of campus, and this sort of living experience more closely resembled the way families live in Pakistan. The neighbors also did a lot of community activities together and this turned out to be a real plus since these sort of social interactions are also more common in Pakistan,” Forbes said. The five women participated in a public panel discussion at ASU on March 26 called “Beyond the Hijab: Pakistani Women’s Perspectives.” Each scholar shared her introduction to American culture and focused on dispelling some of the preconceived notions of Pakistani women. During the discussion, panelist Aisha Usman, a member of the English Literature faculty at Kinnaird, addressed a main area of concern – media's role in shaping the perceptions of women in Muslim countries. Usman sees the media as emphasizing the stereotype that women in Pakistan aren’t able to fill leadership roles. But, she pointed out, Kinnaird College is a women’s college where most of the faculty are women. She also revealed that much of Pakistan’s higher education is co-educational, and women have provided strong leadership in that sector. As hoped, the exchange has affected the Pakistani women’s own perspectives. Aurakzai says that she now has a global mindset and will apply newly learned teaching skills when she goes back to her country. Each of the scholars will return to the U.S. this fall to present academic papers based on research they did while at ASU. Several ASU faculty will travel to Pakistan in the fall, and the next cohort of Kinnaird scholars is due to arrive at ASU in spring 2016.